One lucky winner will take home five books, including print copies of two books, Only the Cold Remains by Curran Geist and Gypsies, Tramps and Weeia by Elle Boca in the TotallyAddictedtoBooks.com Lost in Fantasy Giveaway. The giveaway also features digital copies of Snow Island by M.Y. Zeman, Dragon’s Egg by Emily Martha Sorensen, and City of Secrets by Aoife Marie Sheridan. 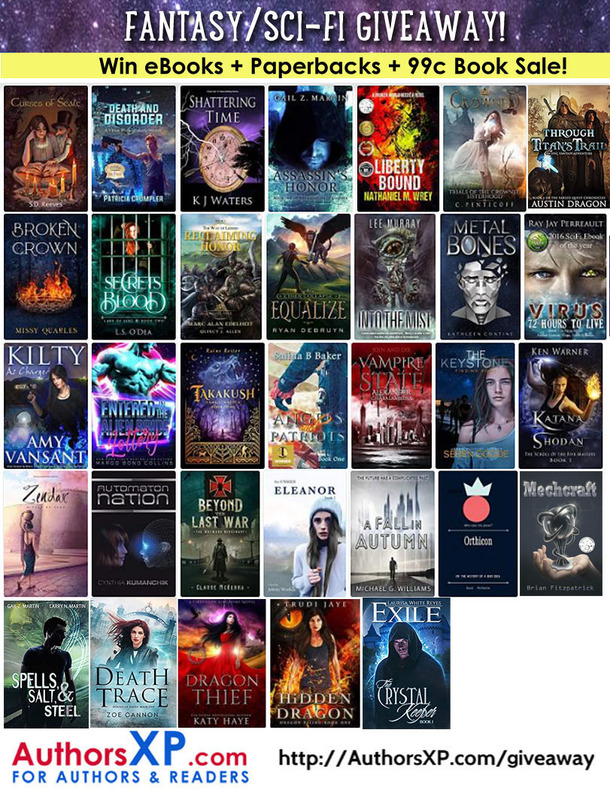 Win Up To 30+ Fantasy eBooks – Nov. 8-14! On August 20, 2016 Whispering Stories, a United Kingdom book review website, published a Guest Post about Weeia by Elle Boca, including a spotlight on Gypsies, Tramps and Weeia. Below is a copy of the post. Thank you Stacey! Sworn to protect the secrets of their race, marshals are trained to police Weeia hiding among humans. After completing her advanced marshal training, Danni is blown away by her new plum assignment to Paris. But, all is not well in the City of Lights; the offices are a shambles, her boss is apathetic, and her predecessors died under mysterious circumstances; it’s almost like somebody doesn’t want the law there. Despite that she risks her life in the seedy underworld of gypsies and tramps to search for a missing Weeia man. Have you ever wondered how it is that some people stand head and shoulders above others in their work? Maybe you admire a celebrity singer, guitar player, chef or dancer. Perhaps the person you noticed is not known outside his or her field of expertise. It could be anyone, a dog walker who has a knack for understanding what’s going on with your pet pooch; a color adviser at the hardware store able to match any color to perfection; a dive master who can do things in the water you thought impossible; or maybe an athlete who breaks world records. The Weeia (pronounced way-yah) are like you or me in almost every way except that they have superhuman abilities. They live hidden among us unnoticed. It could be your neighbor, banker, boss or doctor, even a person you’ve known all your life. Chances are they’re not because most of them live in secluded neighborhoods or small towns. From time to time a few Weeia choose to live with people, usually in big cities where they’re most likely to blend in with the crowds. The abilities of Weeia among us are always explained away. They look like us; they hurt and bleed like we do. Test their DNA. Go ahead. You won’t find anything extraordinary. Their super abilities vary by type and strength. They fall into four main categories: Emotional, Material, Mental, and Temporal. Weeia, it’s the same word for one or many, can be Lowes, Medius or Maximus depending on how strong an ability they have. Lowes is the most common which might explain how extraordinary beings have lived on the same planet with ordinary ones for a long time without anyone, or hardly anyone, discovering their existence. There are multitude abilities among the Weeia, some common and some rare. For example, there are Weeia who can move so quickly no one sees them. Others heal very fast. Some can read people’s thoughts; pick up impressions from inanimate objects; or move things with their mind. There are those who have the ability to influence people and issue commands that must obeyed without fail. Rare Weeia control reality through dreams or travel in time. How can you tell if someone is Weeia? You can’t. Because so few Weeia exist among billions of humans they protect their identity fiercely. Weeia’s most sacred law forbids revealing their existence or abilities to humans on penalty of death, to Weeia and human. Weeia abilities first manifest in young adults. Something strange is happening and the most recent generation is not developing abilities the way they should. Amy McKnight is an exception. Raised as a human, she discovers her true Weeia nature without warning or preparation. She’s a quick study, but her life is turned around when she begins having odd dreams that are much more than she could ever imagine. Elle is the author of two urban fantasy series about superhumans called Weeia, the Unelmoija Series in Miami and the Marshals Series in Paris. Growing up the only child of a monkey mother and a rabbit father she learned to keep herself entertained and spend time reading. Elle makes her home with her king cat husband in South Florida. Danni has completed her training to become a marshal, the police sworn to protect Weeia hiding among humans, and is surprised to receive a good assignment in Paris. However, when she gets there Danni discovers that not all is as she was expecting, with an apathetic boss, an office in shambles and her predecessor Marshals dying under mysterious circumstances. Despite the risks, Danni is determined to do her job, even if some in Paris believe they are above the law. Gypsies, Tramps and Weeia is an action-packed book set in the Weeia universe. It is enjoyable and really well written, especially when describing Paris. This book also had suspense and humour. Danni is persistent and determined to do a good job and to prove herself, she also comes across as blunt and abrupt but that is just a front because she is really insecure. There are a few secondary characters but only one really stands out in my mind, Iaen, as he is cocky, charming and a loveable rogue. I liked that Ernie was in this book and I hope he is in more of the future novels. I enjoyed this book and am looking forward to reading the next book in this series. I would recommend Gypsies, Tramps and Weeia to fans of the Weeia series.